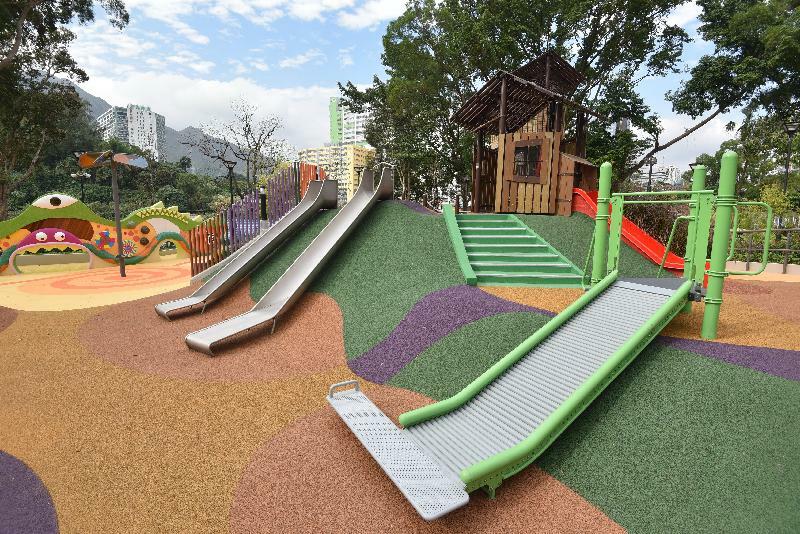 The children's playground in Tuen Mun Park under the Leisure and Cultural Services Department (LCSD) has been converted into an innovative inclusive playground and will be opened for public use next Monday (December 3). 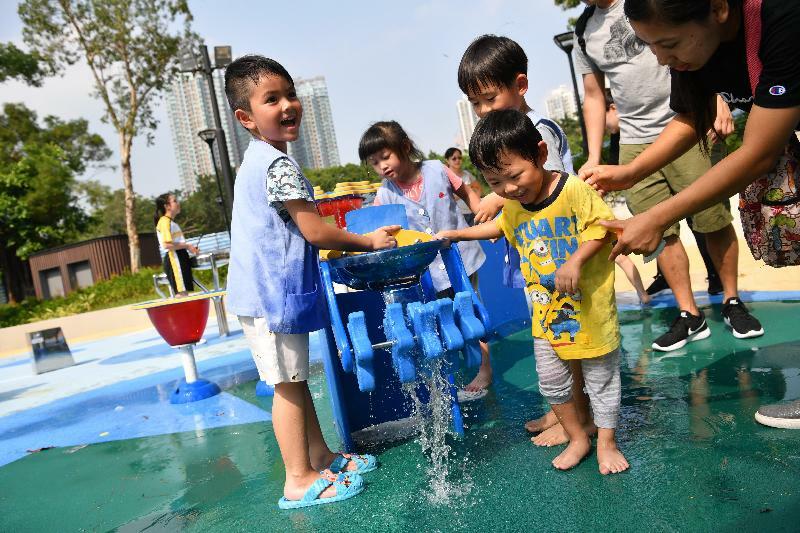 The new playground is the first barrier-free play space for children in Hong Kong incorporating two natural elements, water and sand, in its design. It provides diversified inclusive play facilities for children of different ages and abilities to play together in a harmonious and happy environment. 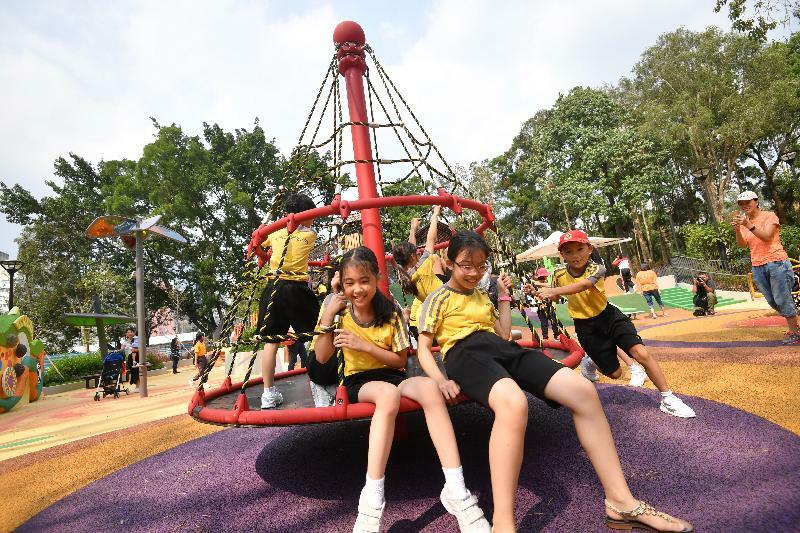 The inclusive playground is composed of two portions, namely the Southern Portion and the Northern Portion, with seven play zones. The overall layout of the playground and its play components are specifically designed for children with different physical abilities, including wheelchair users. The Northern Portion is designed as a Water Lily Park with three zones: the Flower Dew Plaza, the Contour Play Zone and the Musical Zone. 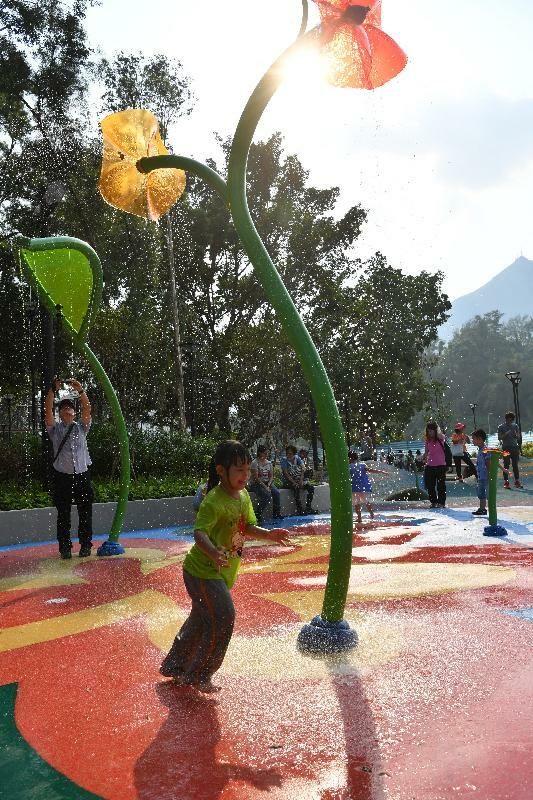 The Flower Dew Plaza is a water play area with a light and shadow effect, providing flower-shaped splash pads and water cascade facilities for children to enjoy the fun of playing with water in the park freely. Equipped with balancing facilities like spinning plates and a trampoline, the undulating Contour Play Zone gives challenges to children to practise their balancing skills. The Musical Zone, where giant musical instruments such as chimes and drums are installed, can stimulate the sense of hearing of the children. The Southern Portion comprises four zones under the design concept of "Reptile Fun" as inspired by the Reptile House in the park. The four zones are the Egg Hunter area, the Reptile Paradise, the Spinning Zone and the Sensory Zone. 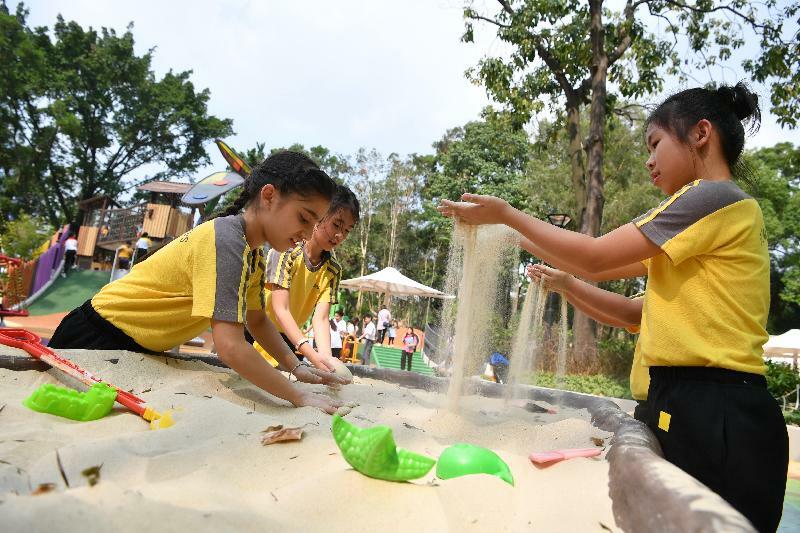 A sand pit and a sand play table have been set up at the Egg Hunter area where children can play egg-hunting, with a view to encouraging children's creativity and social interaction. In the Reptile Paradise, children can enjoy challenges on the climbing tower and nets with different heights and difficulty levels, as well as have fun on different types of slides. 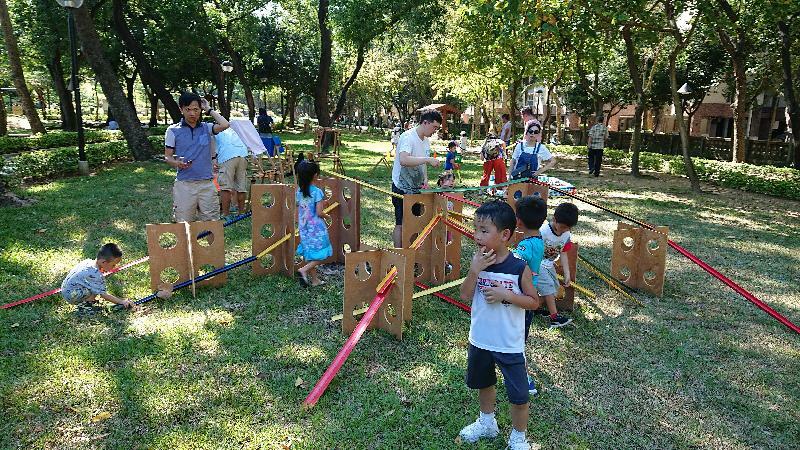 While in the Spinning Zone and the Sensory Zone, various types of swaying and spinning play equipment, sensory walls and other tactile movable parts can appeal to children's senses of sight and touch. A swing area is also provided adjacent to the Southern Portion of the playground, featuring two sets of swings including a nest swing, a swing seat and a parent-child swing to cater for the needs of different users. It will be fun for parents to ride with their kids face-to-face on the parent-child swing. 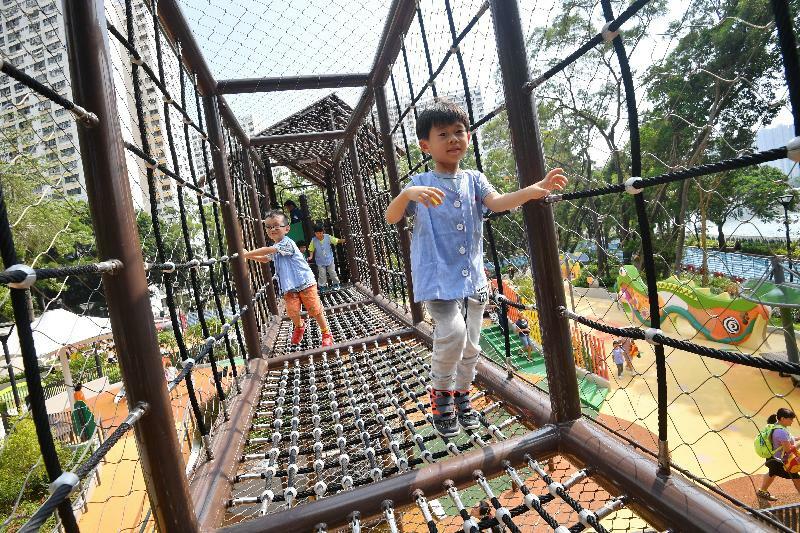 A spokesman for the LCSD said, "Through sand, water, swaying and rotating play equipment, a climbing tower and movable parts for knocking and touching in the playground, children of different ages and abilities can all enjoy the fun of playing while acquiring different skills which foster balanced development of their body and mind." 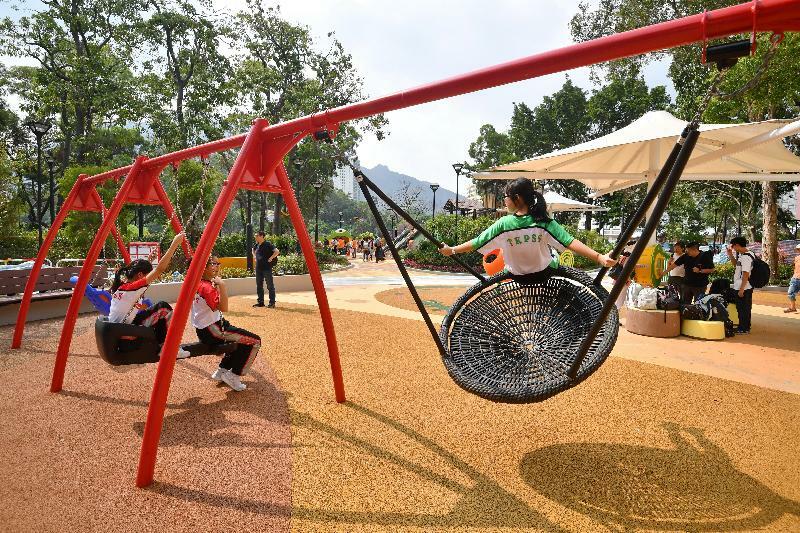 The inclusive playground in Tuen Mun Park was built under a pilot scheme adopting the winning concepts of the Inclusive Play Space Design Ideas Competition with the collaboration of the LCSD and the Architectural Services Department. The LCSD will evaluate public feedback on the pilot scheme, consolidate experiences and continue to heed the views of relevant concern groups, organisations and District Councils so as to make continuous enhancements to the facilities of children's playgrounds. Meanwhile, the LCSD has assisted the Playright Children's Play Association and relevant non-governmental organisations to roll out a three-year Community Build Playground (CBP) project at four major LCSD parks from September 2017 to August 2020 in order to enhance the play experience of children. 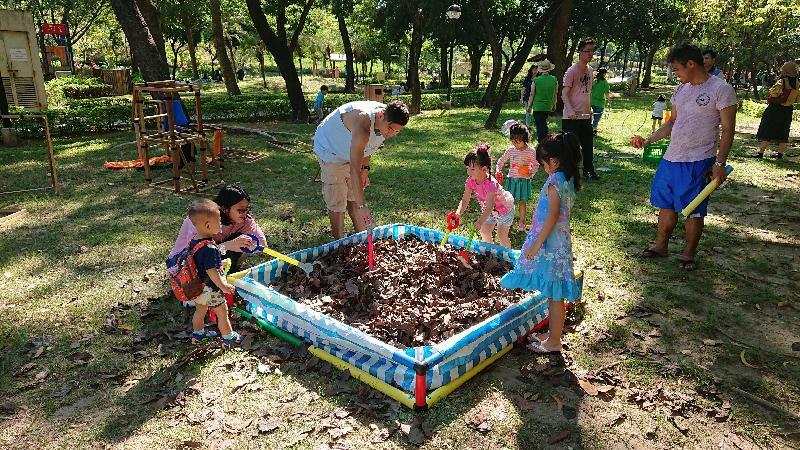 CBP is a new concept that enables children to partner with their parents, by using simple tools, to create their own playground and to explore through imagination and co-operation in the parks. 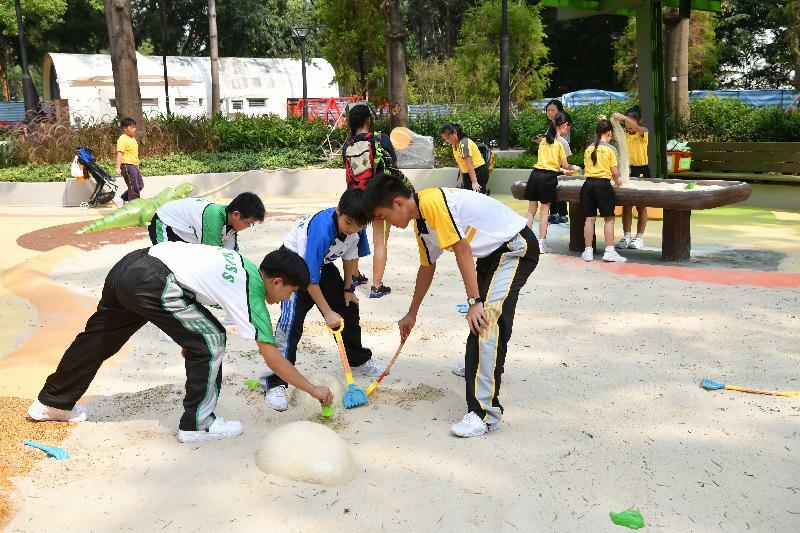 The project has earlier been conducted in Tai Po Waterfront Park and is now being conducted in Lai Chi Kok Park, while the remaining two CBP activities will be held in parks on Hong Kong Island and in the New Territories in the next two years. Apart from outdoor children's play facilities, a total of 38 indoor children's play rooms are also provided in the LCSD's sports centres. Featuring various themes like ocean world, sailing space adventure, adventure of mining and candy house, the children's play rooms provide colourful play mats and facilities which enable children to play and learn different skills together with a view to enhancing their physical and psychological development. For details on the children's play rooms and other inclusive play facilities under the LCSD, please visit the department's website.